Celebrate with your nearest and dearest, tucked away in the lush mountains of the north-east coast. Olive and citrus groves surround our idyllic event spaces, making for picture-perfect Mallorca weddings and celebrations. Our expert teams of chefs, butlers and conference managers serve up superb events you’ll never forget. 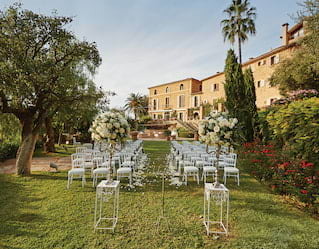 The breathtaking beauty surrounding Deià makes Belmond La Residencia a picture-perfect venue—and we boast a wide range of tempting wedding options. Indulge pre-ceremony with a special wedding party package; start the celebrations early with a stylish cocktail reception in our sun-splashed gardens; sit down to a set menu of sumptuous local fare. We look forward to crafting a bespoke celebration you’ll never forget. Start your new life together in blissful seclusion on our flower-fringed estate before venturing outside for a little local flavour. Explore your creative sides with an art class. Hike hand-in-hand through the rugged hills. Or even better, let the hotel pack you a picnic on one of its resident donkeys and amble up into the ancient terraces for a Mallorcan feast with a mesmerising view. 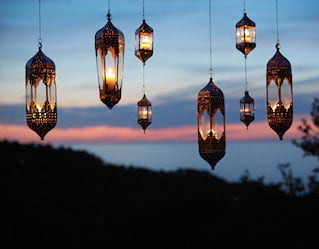 Whether an intimate anniversary dinner or a grand milestone birthday party, we’ll help add extra sparkle to any event. Our in-house experts will work with you to find the perfect space to suit your needs. We’ll advise on great group activities, such as sunset cruises and hands-on cookery classes, as well as spectacular entertainment. Priceless memories are guaranteed. Our spectacular meeting spaces are perfectly paired with impeccable service and state of the art technology. 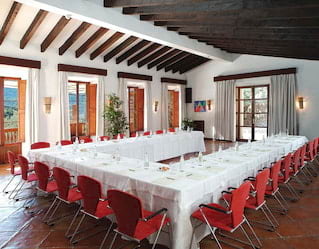 Albéniz enjoys an expansive terrace and room for up to 80 people. Son Fony has a striking glass rooftop, and intimate Es Teix is perfect for smaller groups. Or discover a world outside the boardroom with our exciting incentive options. From mountain treks and picnics with our lovable donkeys Pancho and Luna to spectacular hot-air balloon rides, your event is sure to be a talking point for years to come.